Britney and Mike were married in an intimate ceremony in their backyard on October 15th, 2016. Their backyard, affectionately nicknamed "The Haunted Woods," made perfect sense for a venue because they did not want to go overboard with spending and they really wanted to keep the day low-key with just their closest friends and family in attendance. They decided on their backyard for the ceremony and reception space because they love the seclusion and the big ol' trees. 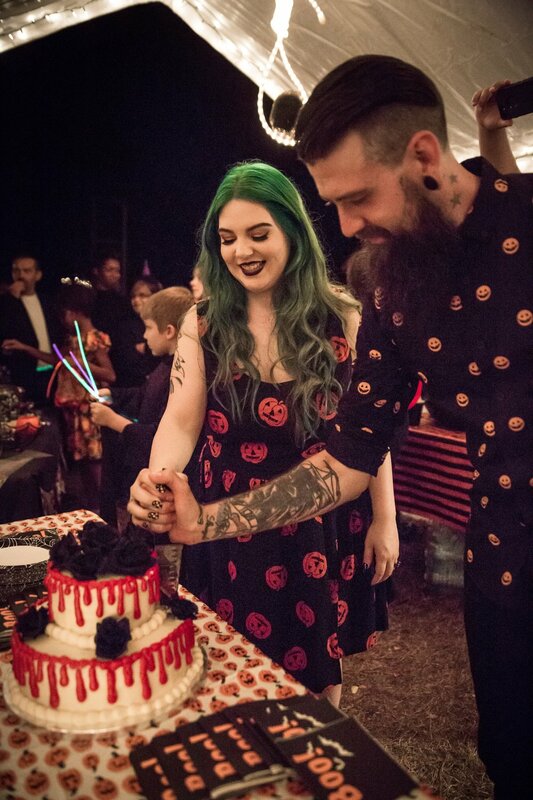 It is beautiful and spooky all in one and it was perfect for a Halloween-themed wedding, which is their favorite holiday. The couple originally met on MySpace while Britney was living in Ohio and Mike in California. They were strictly friends, since Mike had a girlfriend at the time, but the two kept in touch on various old-school social media for a little over a year before the newly-single Mike got the chance to visit Ohio under the guise of a work trip. That night they went out for Mexican and per Britney it was a perfect first date. "He opened my door for me when we got there and I got out and he just grabbed me and kissed me," said Britney. "He said he had been waiting to do that since he saw me. It was super cute!" A couple weeks after the Ohio trip, Mike asked Britney to live with him in California and she moved a month later. Much like their courtship and the wedding itself, Mike's proposal was not frou-frou or over the top, but very sweet, intimate, and full of love. After dating for six years, Mike popped the question by simply getting on one knee and asking Britney to marry him in their bedroom. Britney had just gotten out of the shower and was still dripping wet. She, of course, said yes. With a guest count of 50, this laid-back couple did not stress about budget and just put stuff together that felt most like "them" with a little help from Britney's mom and stepdad. The props and decorations for the reception were the focal point of the festivities. Mike and his stepdad spent a lot of time building props and the couple used a lot of their personal collection for decorating. 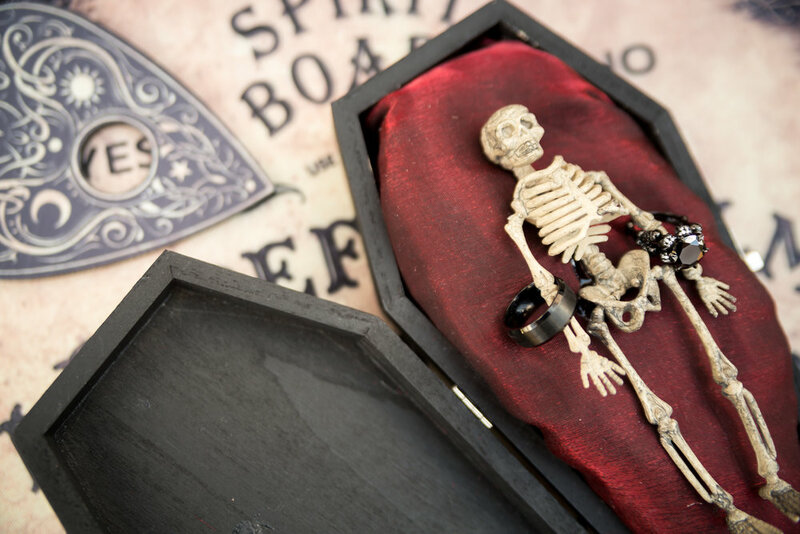 Britney and Mike do not consider themselves traditionalists so they eschewed place cards and big floral arrangements and only dressed up their sweetheart table, which had a big coffin heart behind them. Britney took a chance and ordered her ceremony dress online from Zoe Prom and the couple both changed into spooky outfits for the reception. Britney's jack-o-lantern dress was from the Etsy seller ImYourPresent (ed. note: they do custom sizing and orders). Mike's suit was from Men's Warehouse and his jack-o-lantern shirt was from ASOS. Britney's favorite part of the day was sitting down for dinner (pizza!) after the first dance and just having a moment to relax and take everything in. "We were husband and wife and we were surrounded by loved ones and friends and it was the spookiest night," said Britney. The bonus favorite part: there was a big beautiful full moon that just tied it all together. Mike's favorite part of the day was the ceremony itself. "Looking at you and knowing that this was it," said Mike. "Out of everyone there, you’re the only thing that mattered and you were/are so beautiful and perfect."